Do you want to play a game this Halloween? 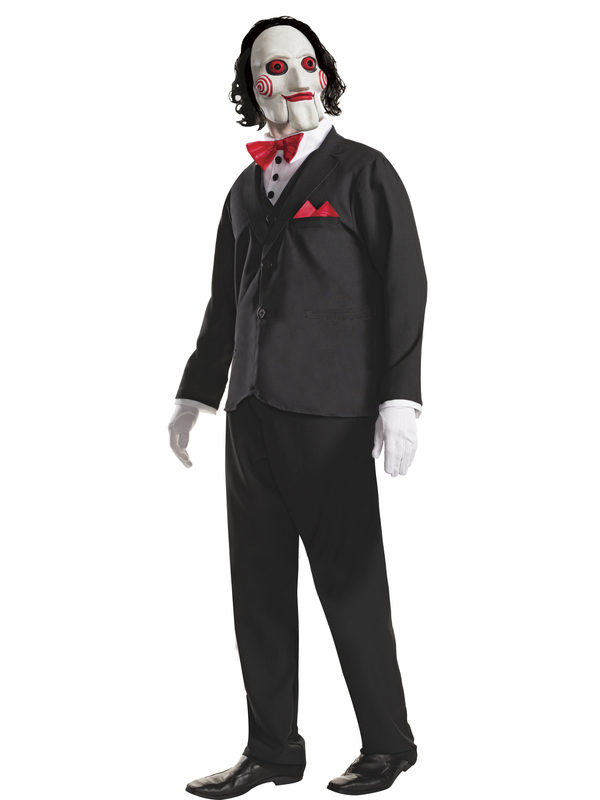 Order the Adult Billy the Puppet Saw Costume for Men. It comes with a mask, jacket, pants and a dickie. Officially licensed, the mask looks like the one worn by the ventriloquist's dummy in the films. It has creepy red eyes, red mouth and red spirals on the cheeks. The villain of the Saw movies, known as Jigsaw, is unlike other bad guys in popular horror movies. He doesn't actually kill anyone but instead puts people in situations and uses a puppet, Billy, to communicate to them that they may have to kill someone to survive. He does this believing that most people are ungrateful for being alive, but after facing death they become grateful. You don't need to do anything as drastic to appreciate life, just put on this costume and head to a fun Halloween party.